Shirley with the Cinque Torri Group in the background. 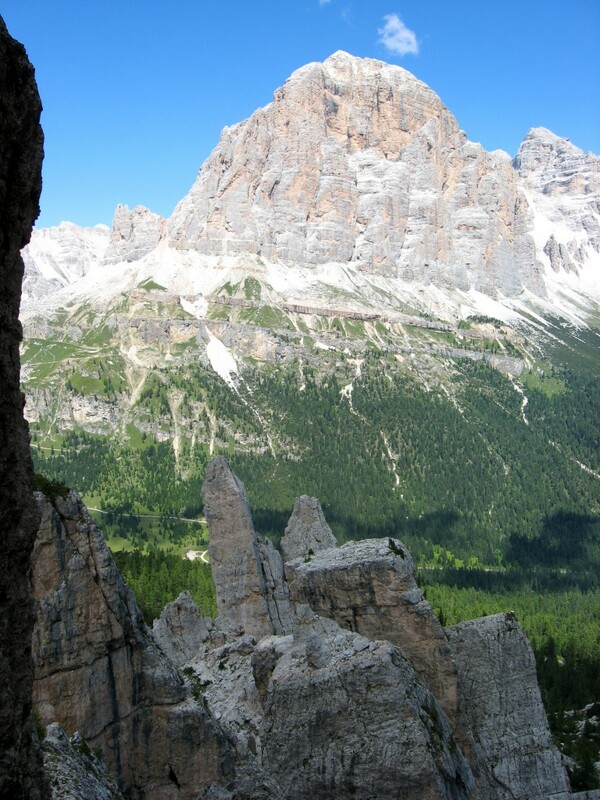 Torre Grande dominates the view (Aug. 2008). 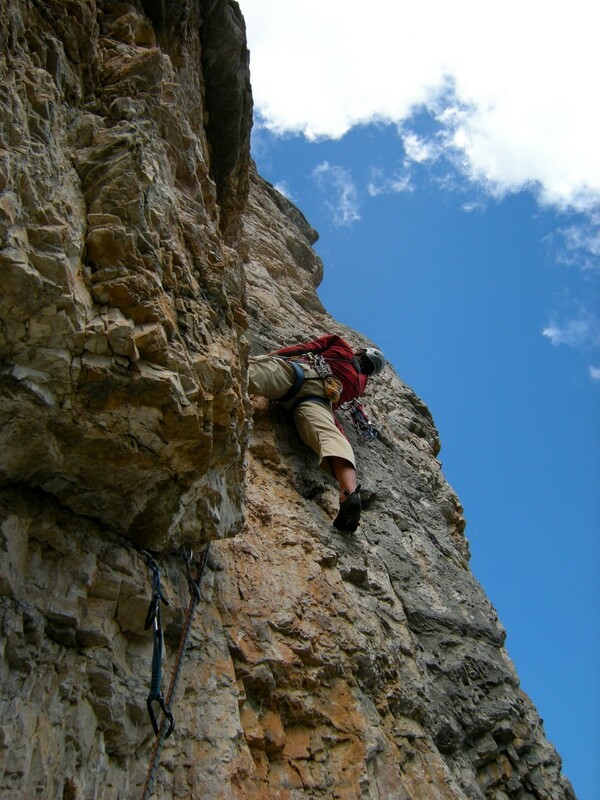 Given that our previous limestone climbing experience consisted of about 20 feet of climbing – all in Sedona, AZ where the three towers we’ve done have a 4-8 foot tall limestone band embedded in the sandstone – we had no idea what to expect. 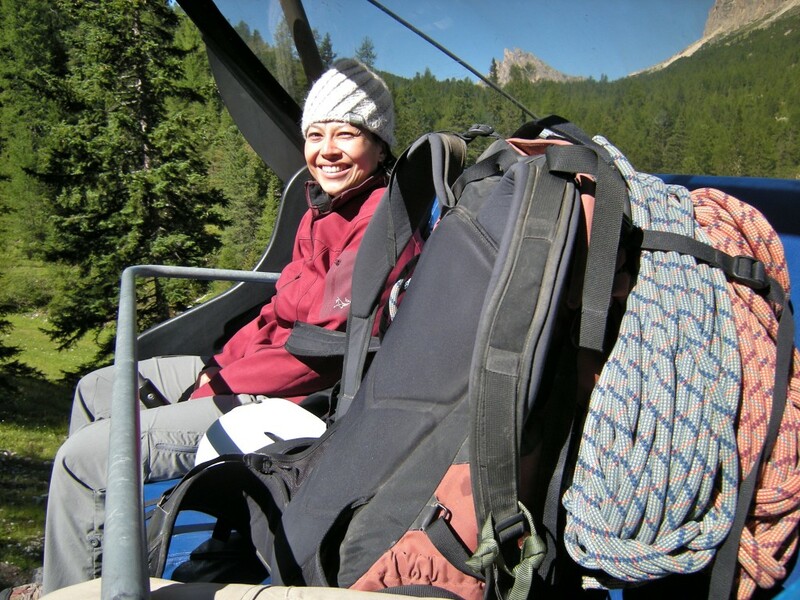 We set our expectations low as we rode the chairlift up to the Cinque Torri Group above Cortina. 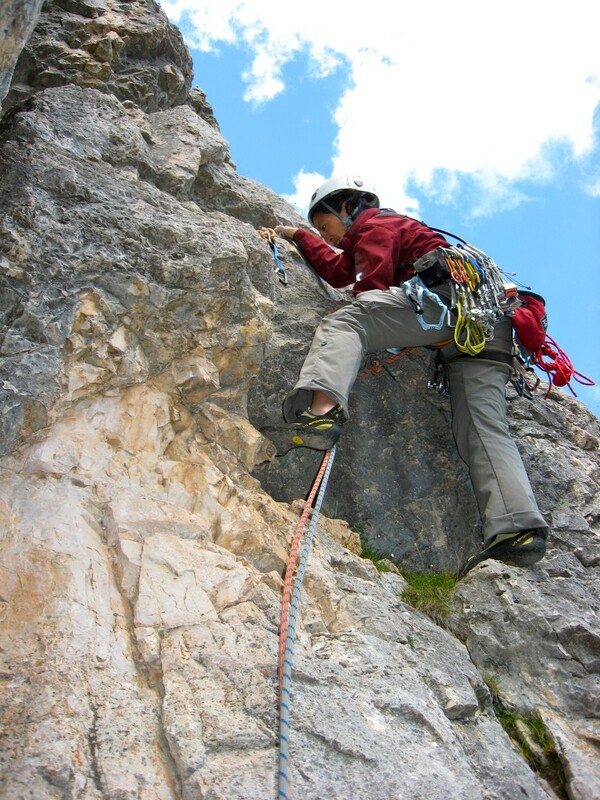 A grueling 5 minute approach brought us to the base of the “IV” route on Torre Grande/Cima Ovest. Rock is solid (despite the appearance from afar), grippy and well-featured. Scenic if crowded summit. 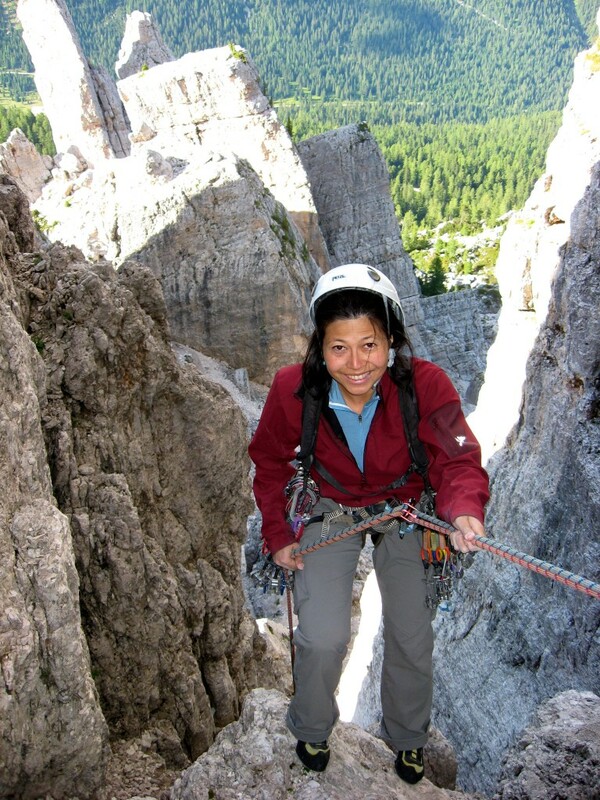 Shirley at a semi-hanging belay midway up Via Miriam on Torre Grande (this is like top of pitch 3 I think; Aug. 2008). Before heading down, we also got on Via Miriam next door. Nice route as well even if the first pitch is very polished. Things went well till I screwed up on the final pitch following a dead end line of loose pegs (felt harder than the expected grade V…). Mistake was corrected shortly at the cost of a nut (not mine fortunately!) and we were hiking down to the car making plans for the next day. Shirley enduring the epic approach to the Cinque Torri area (Aug. 2008). 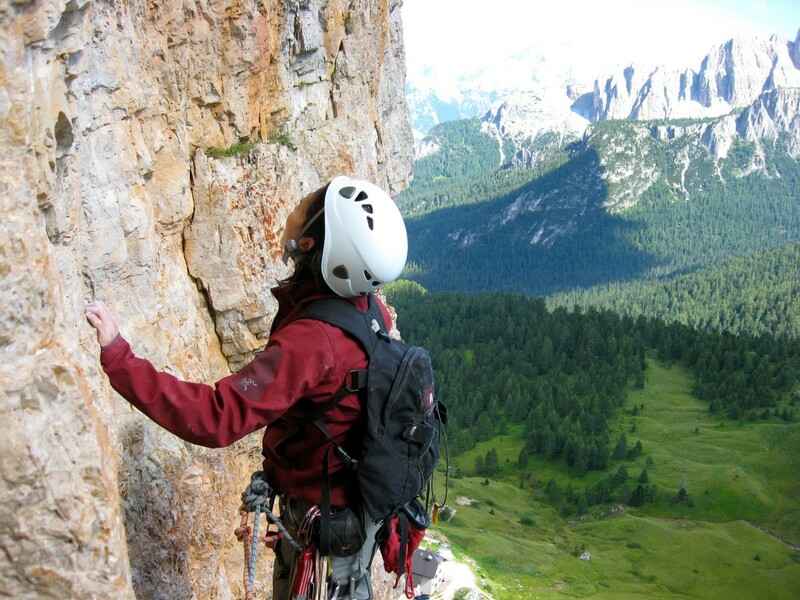 Double checking the guidebook at the first belay on Via Del Guide (Aug. 2008). Shirley somewhere on the short Via Del Guide on Torre Grande (Aug. 2008). 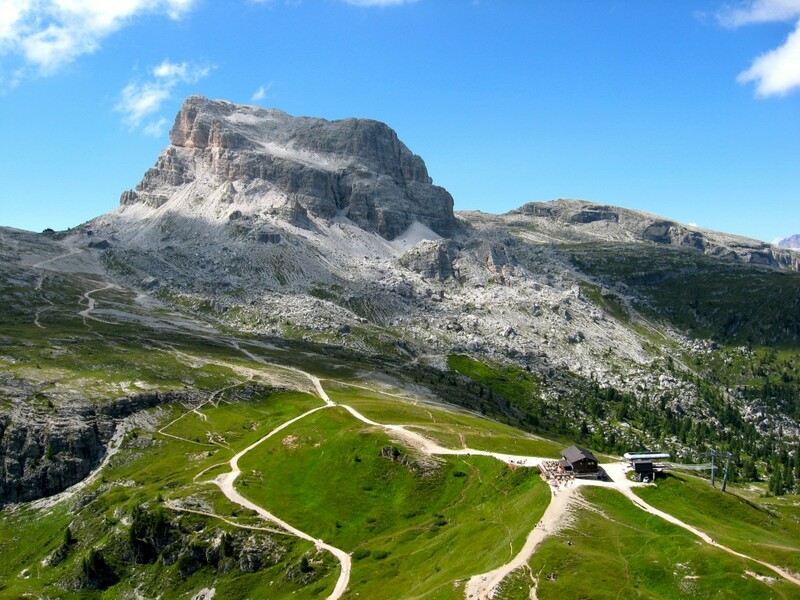 Looking back at the short approach to Via Del Guide from the top of the chairlift and Rifugio Scoiattoli (Aug. 2008). 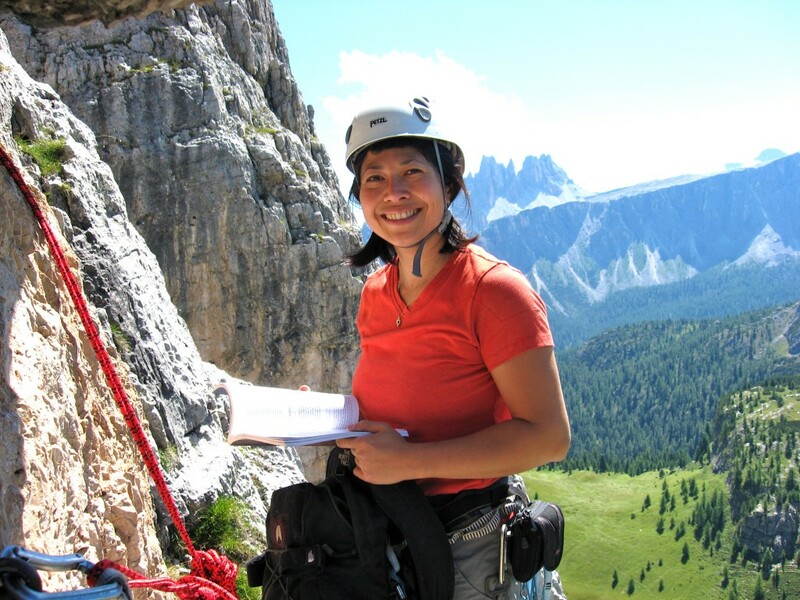 Shirley on Via Del Guide (Aug. 2008). 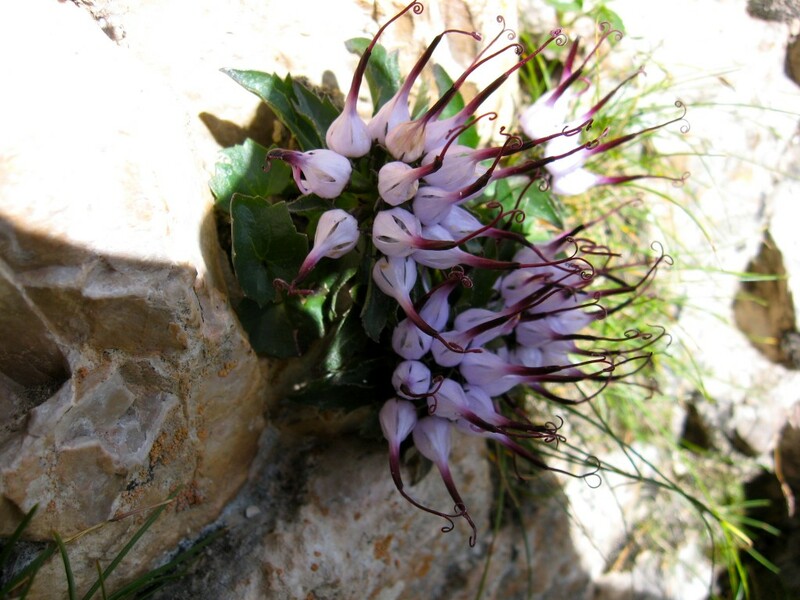 Some pretty flora of the Dolomites (Aug. 2008). 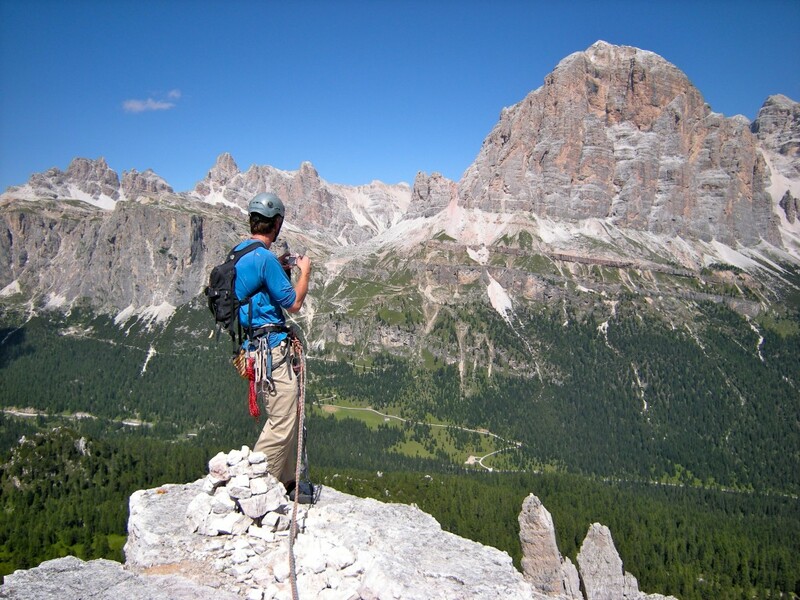 Yours truly on the summit of Torre Grande with Tofana di Rozes in the background after our climb of Via delle Guide (Aug. 2008). 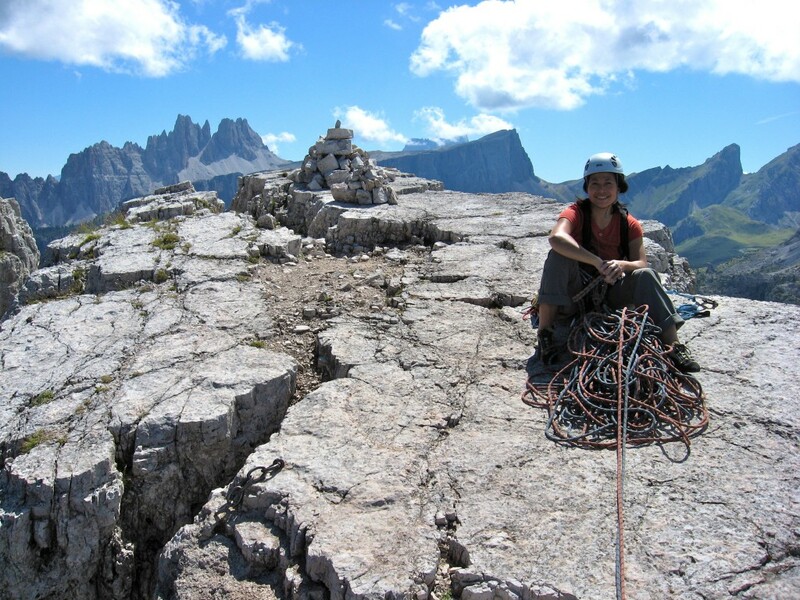 Shirley on the summit of Torre Grande's West Summit after our climb of the Via Del Guide (first route we did beyond the North American continent; Aug. 2008). 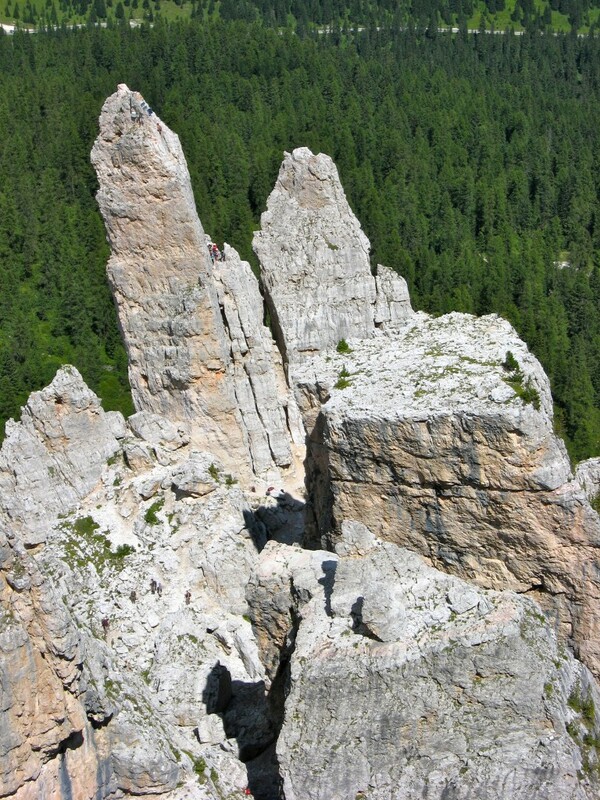 Unknown climbers on Torre Barancio as seen from the top of the Via Del Guide (Aug. 2008). 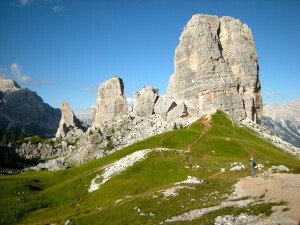 Tofana Di Rozes (the big one) and Torre Barancio (the small one...in foreground) as seen from the descent from the West Summit of Torre Grande (Aug. 2008). 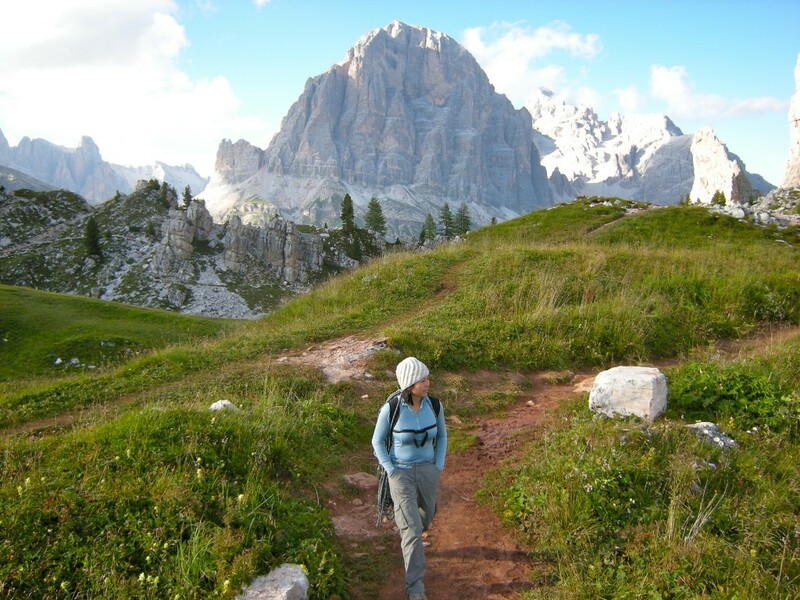 Shirley hiking over to the start of Via Miriam after our climb of Via Del Guide...both on Torre Grande (Aug. 2008). 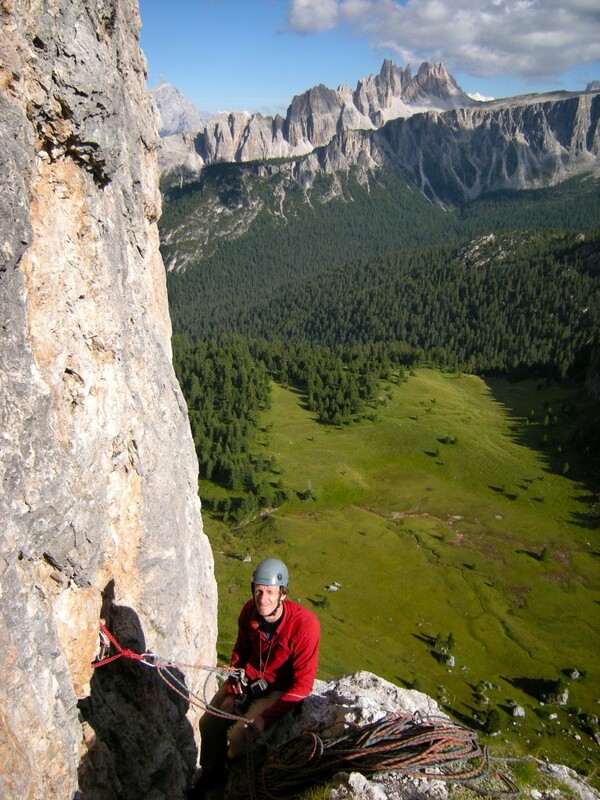 Shirley topping out on Via Miriam's pitch 1 (or maybe 2) on Torre Grande (Aug. 2008). 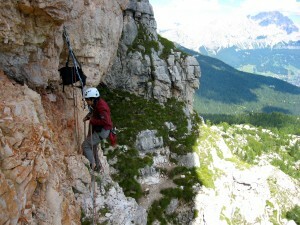 Shirley leading a pitch (#2 I think) on Via Miriam of Torre Grande (Aug. 2008). 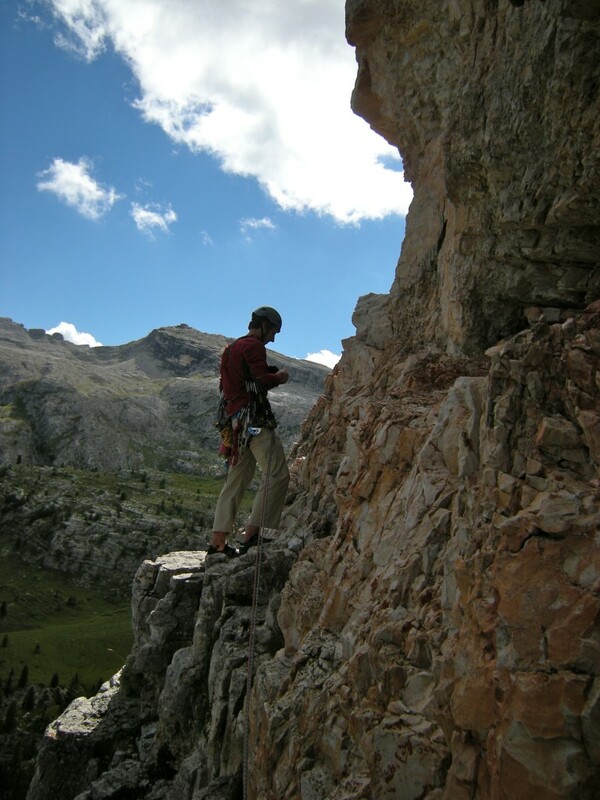 Leading pitch 3 (I think) of Via Miriam (UIAA grade V) on Torre Grande (Aug. 2008). 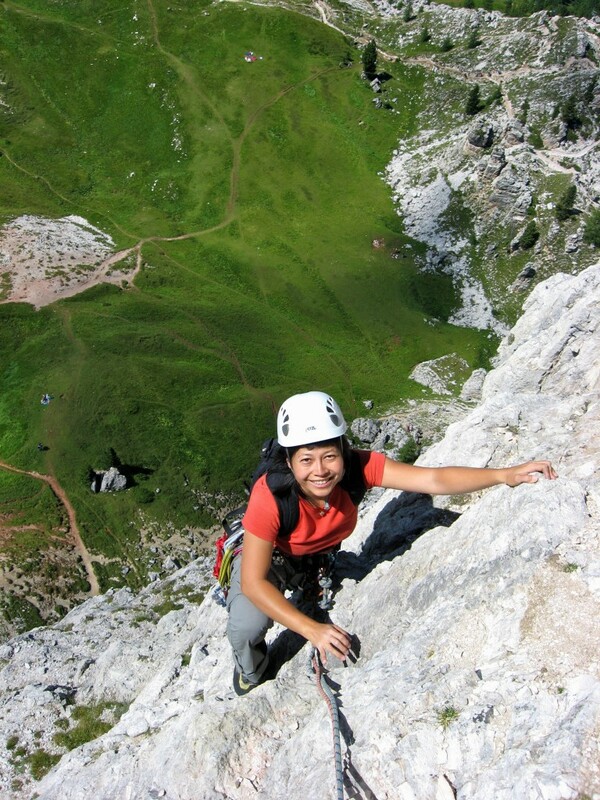 Shirley midway up Via Miriam on Torre Grande (Aug. 2008). 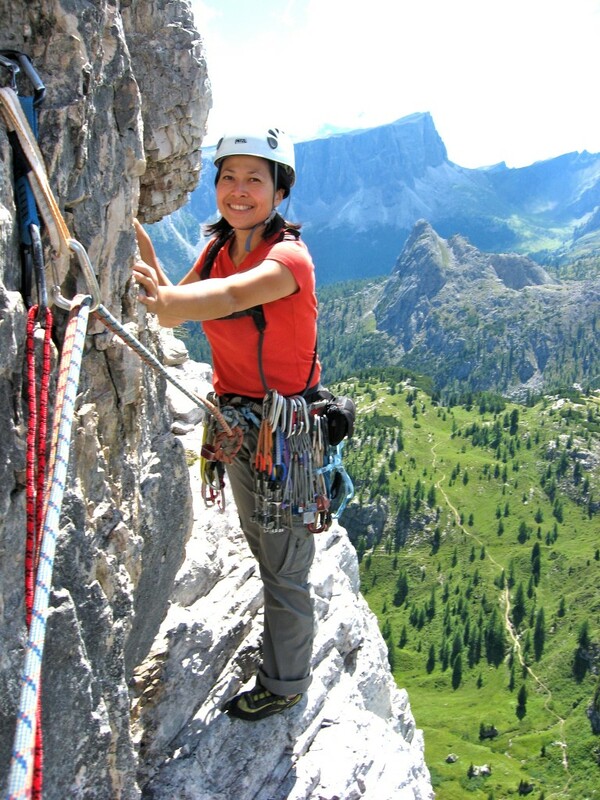 Shirley at the third belay on Via Miriam looking at where the fourth pitch goes (Aug 2008). 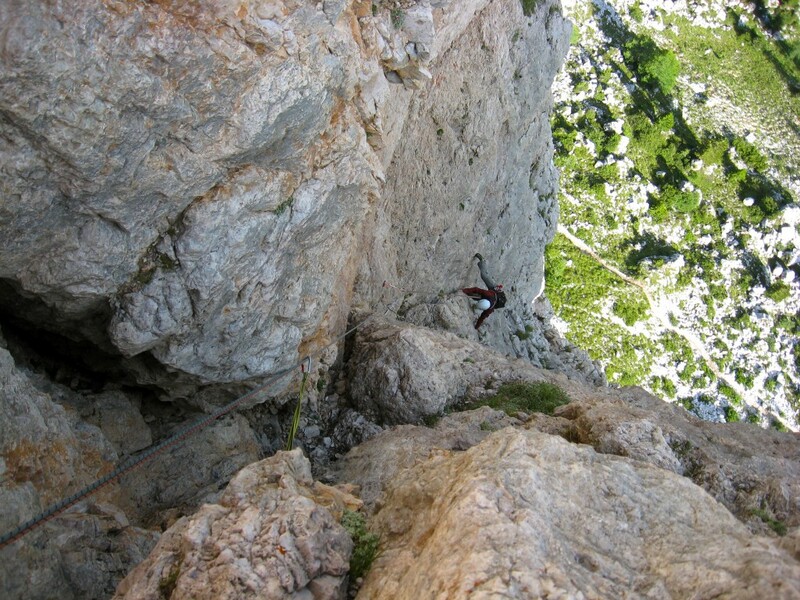 Off-route start to pitch 4 of Via Miriam (Aug. 2008). 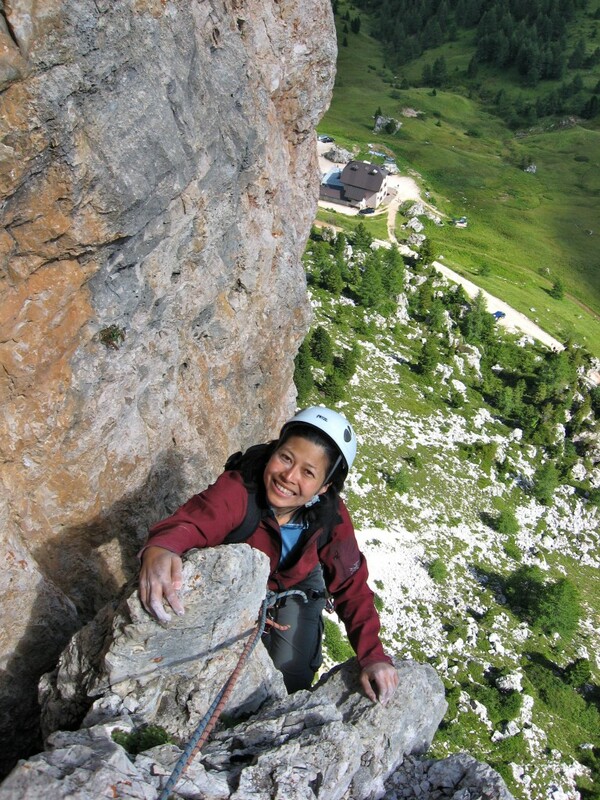 Shirley following the fourth pitch of Via Miriam (Aug. 2008). 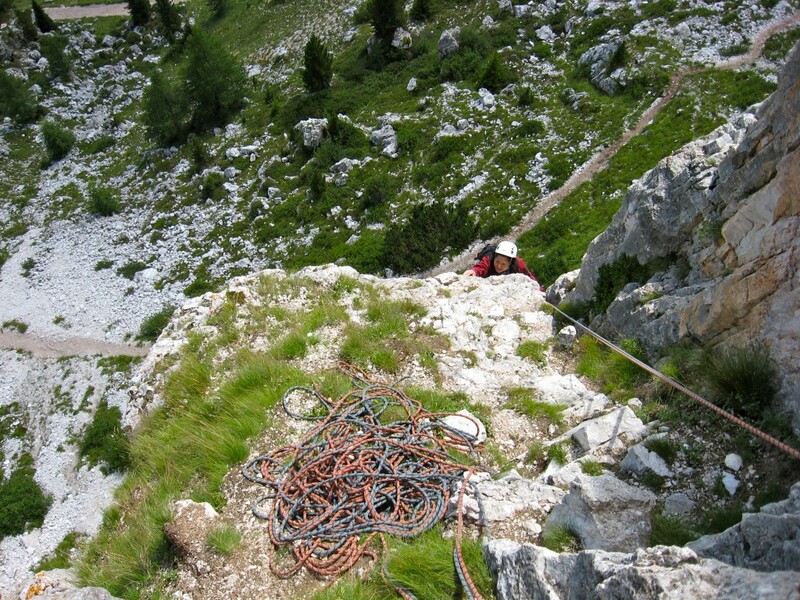 Belaying Shirley on the exit pitch (#5) of Via Miriam on Torre Grande's South Summit (Aug. 2008). 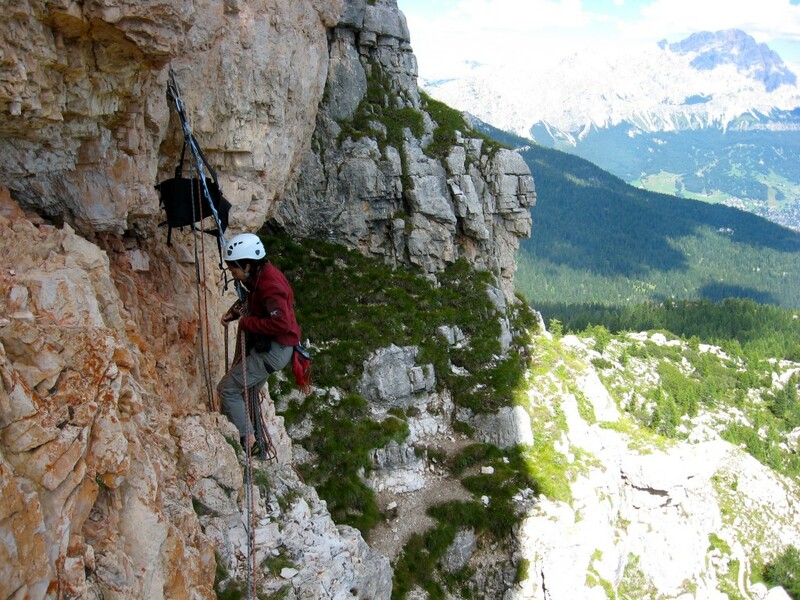 Shirley rapping off Torre Grande after our first day of Dolomites climbing (Aug. 2008). 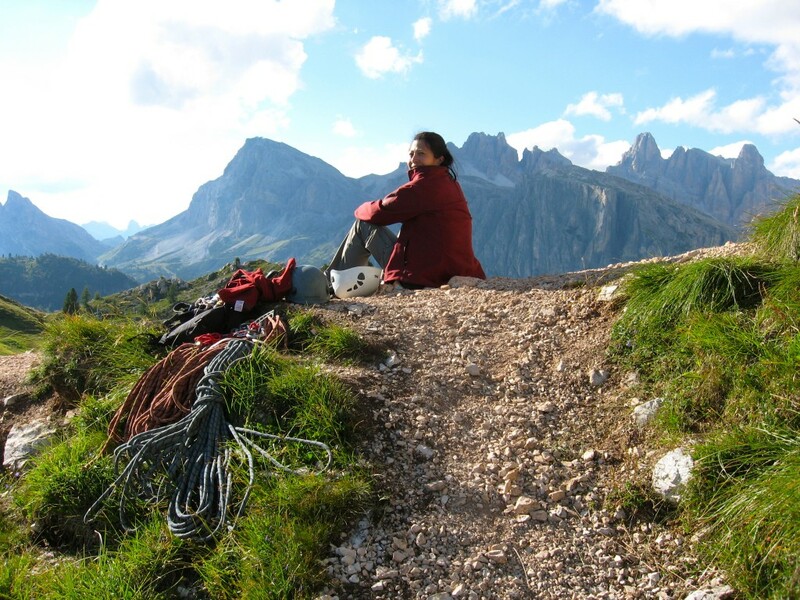 Taking in the splendor of the Dolomites after our first day of climbing there (Aug. 2008). 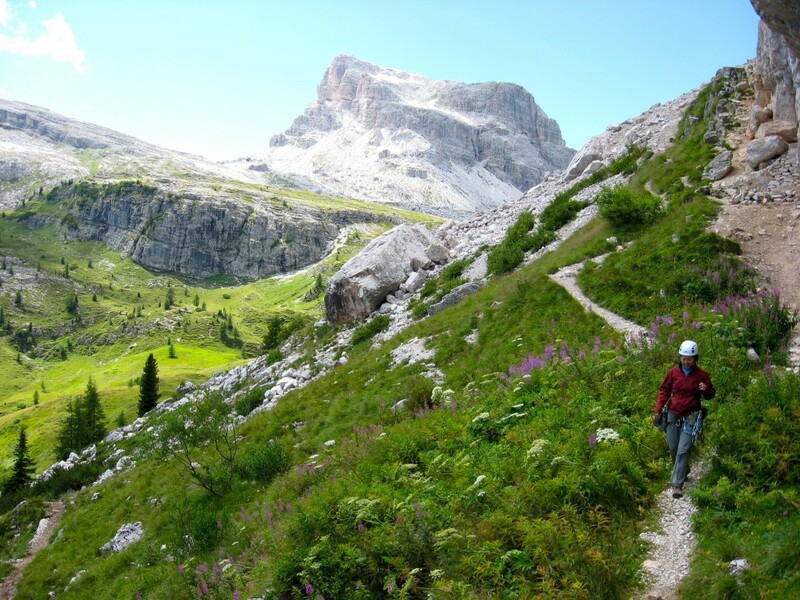 Shirley hiking down from our day of climbing on Torre Grande. Tofana is in the background (Aug. 2008).